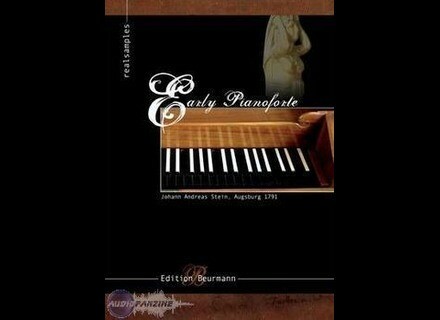 Early Pianoforte, Piano Sample from Realsamples. Following their ongoing Edition Beurmann, German sample manufacturer realsamples brings another piano of the renowned collection of Professor Andreas E. Beurmann, offering 32 velocity layers. Sporting a sound and feel far from any other pianoforte, the Stein instruments were a personal favorite of Mozart. For dynamics and feel, realsamples captured 32 velocity layers of each note. Furthermore, 8 variations of each key release sound were recorded to complete the experience of this instrument. The sample library contains more than 2500 single samples. For the challenging task of recording the historical pianoforte, vintage Neumann™ TLM-170®microphones were used in conjunction with Crane Song™ Flamingo® preamps and Universal Audio™ 2192® digital converters. For maximum sound quality, realsamples recorded in 192 khz/24 bits, resolutions of your choice are available as well. The virtual Stein Pianoforte can be used with samplers like HAlion®, Kontakt®, EXS24®, Independence®, MachFive®, VSampler3® and GigaStudio®, amongst others. The sample library is available in 44.1/48 khz, 96 khz and 192 khz resolution, starting at $159.95. The instruments can be purchased directly on the realsamples website on DVD. 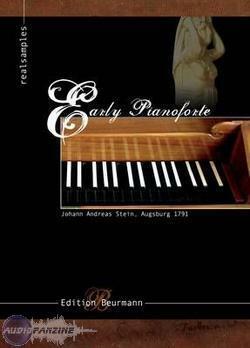 In addition to the samples, the Early Pianoforte library contains an essay in German from Professor Andreas E. Beurmann himself, explaining both the historical and musical background of the instrument. For more information, visit their web site at www.sampling-cds.com. Native Instruments "Komplete Your DAW" Native Instruments has launched "Komplete Your DAW", a time-limited special offer that allows owners of selected professional music sequencers to purchase the KOMPLETE 5 bundle with a discount of 30% from June 2nd to July 31st, 2008. M-Audio Midisport Anniversary Editions These USB MIDI interfaces deliver new designs to commemorate M-Audio's 20th anniversary; and are bus-powered and class-compliant with Windows XP, Vista and Mac OS X. Audio Damage Kombinat Audio Damage has announced the release of Kombinat, a new multi-band distortion plugin.